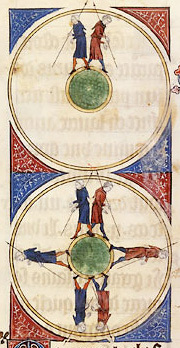 Illustratio Telluris sphaericae in saeculi 14 editionem libri L'image du monde (c. 1246). Mythus Telluris planae est nostrae aetatis erratum quod medii aevi cosmologiam tellurem planam, non sphaericam, habuisse ducit. Inter primas medii aevi partes, omnes fere scholastici tellurem sphaericam sciverunt, quam sententiam a Graecis obtinuerant. Ex saltem saeculo quarto decimo, telluris planae fides paene omnino non fuerat inter doctos, etsi huius temporis artifices phantastice tellurem depingere soliti sint, puta in Horto deliciarum, Hieronymi Bosch triptycho, in quo tellus disci specie effincta intra sphaeram translucidam fluitat. ↑ Russell 1991, p. 3. Vide etiam Russell 1997. ↑ Gombrich 1969, pp. 162–170. Abrams, Ann Uhry (1993), "Visions of Columbus: The 'Discovery' Legend in Antebellum American Paintings and Prints", American Art Journal (1993), pp. 74-101 25 (1/2): 74–101 . Bishop, Louise M. (2008), "The Myth of the Flat Earth", in Harris, Stephen J.; Grigsby, Bryon Lee, Misconceptions about the Middle Ages, Routledge, ISBN 978-0-415-77053-8 . Bolenius, Emma Miller (1919), The Boys' and Girls' Reader: Fifth Reader, Houghton Mifflin . Boorstin, Daniel (1983), The Discoverers, Novi Eboraci: Random House Publishing Group, ISBN 9780394402291 . Draper, John William (1874), History of the Conflict between Religion and Science, New York: D. Appleton and Company . Garwood, Christine (2007), Flat Earth: the history of an infamous idea, Macmillan, ISBN 0-312-38208-1 . Gombrich, E. H. (1969), "Bosch's "Garden of Earthly Delights": A progress report", Journal of the Warburg and Courtauld Institutes 32: 162–170 . Irving, Washington (1861), The Works of Washington Irving, University of Michigan Library . Letronne, Antoine-Jean (1883), "Des Opinions cosmographiques des Pères de l'Église", in Fagnan, Edmond (Francogallice), Œuvres choises de A.-J. Letronne, 2, Géographie et Cosmographie, 1, Paris: Ernest Leroux, pp. 382–414 . Lindberg, David C.; Numbers, Ronald L. (1986), "Beyond War and Peace: A Reappraisal of the Encounter between Christianity and Science", Church History (Cambridge University Press) 55 (3): 338–354 . Loewen, James. W. (1996), Lies My Teacher Told Me: Everything Your American History Textbook Got Wrong, Touchstone Books, ISBN 978-0-684-81886-3 . Members of the Historical Association (1945), Common errors in history, General Series, G.1, London: P.S. King & Staples for the Historical Association . Morison, Samuel Eliot (1991) , Admiral of the Ocean Sea. A Life of Christopher Columbus, Little, Brown & Co., ISBN 0-316-58478-9 . Nunn, George E.; Edwards, Clinton R. (1992) , The Geographical Conceptions of Columbus, Milwaukee Visconsiniae: American Geographical Society Golda Meir Library, ISBN 1879281066 . Russell, Jeffrey Burton (1991), Inventing the Flat Earth: Columbus and modern historians, Novi Eboraci: Praeger, ISBN 0-275-95904-X . Russell, Jeffrey Burton (1993), "The Flat Error: The Modern Distortion of Medieval Geography", Mediaevalia 15: 337–353 . Russell, Jeffrey Burton (1997), "The Myth of the Flat Earth", Studies in the History of Science (American Scientific Affiliation) . Turner, Frank M. (September 1978), "The Victorian Conflict between Science and Religion: A Professional Dimension", Isis 69 (3): 356–376 . White, Andrew Dickson (1876), The Warfare of Science, Novi Eboraci: D. Appleton and Company . White, Andrew Dickson (1917) , A History of the Warfare of Science with Theology in Christendom, Novi Eboraci: D. Appleton and Company . Wilson, David B. (2002), "The Historiography of Science and Religion", Science and Religion: A Historical Introduction, Johns Hopkins University Press, ISBN 0801870380 . Novissima mutatio die 20 Iulii 2015 hora 11:20 facta.